If you’re like most people, you’ve never thought of a resume as a strategic document. Instead, you’ve viewed it as a straightforward record of your career history. This is why our resume writing clients see such an amazing difference when they use their new resume. Or why the readers of my resume writing ebook are amazed by the results they get. Because when you think strategically about your resume, you’re able to tell a powerful story that is irresistible to hiring managers and recruiters. What is a Resume Strategy? A resume isn’t a history paper – it’s a marketing tool. By developing a clear strategy, you can then shape a message that will sell. A message that will make recruiters and employers want to call you as soon as they read your resume. That’s what your strategy is – it’s the overarching message you want to communicate. How to Develop a Resume Strategy? So far, I’ve talked about how important it is to understand what employers need and also why you need to fully understand what you have to offer. Where the two meet is your unique value to employers, and that’s the basis for your resume strategy. So for a sales position, the hiring manager might be looking for someone to open a new territory. In this case, a key message might be the ability to build a sales territory from the ground up, or the ability to quickly build a pipeline of new customers. A graphic designer might identify her biggest strength as her ability to delight clients with her designs, and decide that this is what she wants to communicate. This may all sound very obvious, but most people make the mistake of trying to communicate too many different messages in one document. It’s easy to start thinking of lots of other things you could also say about yourself – many of which are very positive traits – but if you start adding different messages, you’ll dilute the power of your message. 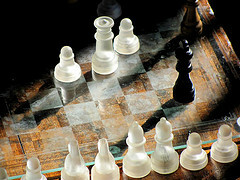 When it comes to resume strategy, less is definitely more. So it’s important to decide on one strategy and then stick to it! (By the way, it’s perfectly acceptable to have several different resumes, each with a different target audience and strategy in mind). What will your resume headline say? How will you communicate your core message right upfront? What evidence can you provide (all the way through the resume) to support your core message? How might you use testimonials from performance reviews or LinkedIn to bolster your message? What past accomplishments will support your message? Are there creative ways to communicate your central message? By keeping your strategy in mind as you structure your resume, you’ll find it much easier to know what you should include and what should be omitted. And you’ll have a document that will press all the right buttons for your target employers and will therefore give them a compelling reason to pick up the phone and call you. In my next post, I’ll show you how to create powerful resume bullet points that support your strategy. If you’d like to be notified when it goes live, just leave your email address with us here. And if you’d like more help getting your resume up to snuff, check out our resume writing e-course. There’s no spam and we never share your contact info.